Posted on 4, July 2016 by EuropaWire PR Editors | This entry was posted in Art & Culture, Entertainment, Media, United Kingdom and tagged art competition, Fake! The Great Masterpiece Challenge, Phil Edgar-Jones, Sky Arts, TV series. Bookmark the permalink. Isleworth, UK, 04-Jul-2016 — /EuropaWire/ — A top secret operation last night saw millions of pounds worth of priceless masterpieces removed from the collections of galleries and museums around the UK. In a further twist, the seven paintings – all by celebrated British Artists – have been switched for copies. The heist has been coordinated by Sky Arts, with permission from the galleries, to launch a month-long national art competition for a new TV series called Fake! The Great Masterpiece Challenge. 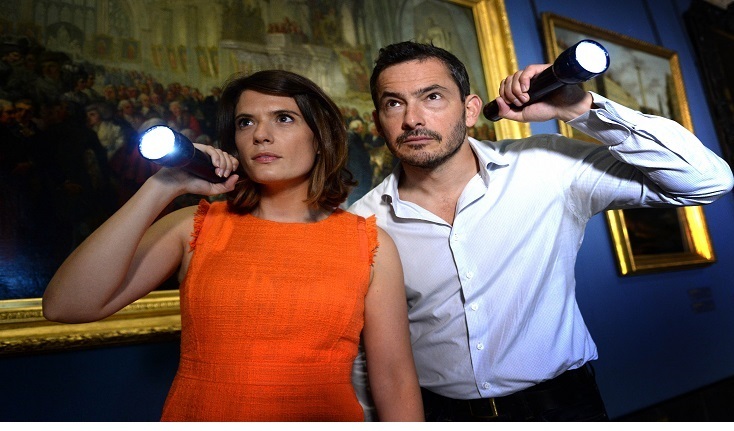 Only the museum curators, the production team from IWC Media, and presenters Giles Coren and art historian Rose Balston, know which pictures are real and which have been replaced. Those with a keen eye, who manage to correctly identify the ‘fakes’, stand the chance of being invited to take part in the series finale. The finalists will compete to win a specially commissioned copy of their very own. Each programme in the series will shine a light on a particular period of British Art, featuring interviews with specialist curators from each gallery and the contemporary artists who have been commissioned to secretly recreate the masterpieces from scratch. During the competition, curator-led tours of these collections are available at each gallery. At the Scottish National Portrait Gallery in Edinburgh, the fake will be hidden in a display on ‘The Art of The Stuart Courts’, including portraits of Mary Queen of Scots, James I and Charles II. At the Lady Lever Art Gallery in Port Sunlight, Wirral, the copy will be placed amid a collection of ‘Golden Age English Portraiture’ by the likes of Sir Joshua Reynolds, Thomas Gainsborough and George Romney. At the Walker Art Gallery in Liverpool, the copy will be hidden amongst paintings of ‘Animal and Sporting Art’ from the 18th and 19th centuries. At the National Museum Cardiff, the copy has been made of a ‘British Landscape’ amongst masters such as J.M.W Turner and Richard Wilson. Manchester Art Gallery’s popular display of ‘Pre-Raphaelite’ paintings with works by Dante Gabriel Rossetti, Ford Madox Brown, John Everett Millais and William Holman Hunt will hide one masterpiece which is not all that it seems. Manchester Art Gallery is also creating a special display of paintings of the city by LS Lowry and Adolphe Valette; one of which will be a copy. The final of the television series will be hosted at the world’s oldest public museum, the Ashmolean Museumin Oxford, where the competition will reach its climax. This is the first Sky television series to be presented by Giles Coren, award-winning critic and columnist for The Times, following his debut on Sky Arts in an episode of ‘My Failed Novel’. His other broadcast appearances involved the hit BBC ‘Back in Time for…’ series and the landmark ‘Supersizers’ series with Sue Perkins. The series is the television debut for Rose Balston, an Edinburgh-educated art historian and writer who lectures for the V&A and founded her own company, Art History UK, to run bespoke guided tours of art and architecture both in Britain and abroad. Fake! The Great Masterpiece Challenge will be recorded throughout July and August and screened on Sky Arts in the new year, when the identity of the seven ‘fakes’ and the artists who have been commissioned to copy them will be revealed. The seven originals paintings will return to the galleries once the competition has ended in August. The competition will be open for the month of July (Saturday 2nd July – Monday 1st August 2016 inclusive) and is open to everyone except those involved professionally in the critical valuation of art (please see T+Cs). There is one fake in each of the seven collections at the six participating galleries. Sky Arts encourages you to guess as many of the seven fakes as you can. The more fakes you guess correctly the more chance you will have of being invited to the final episode of the series. Entries received after the closing date will unfortunately not be valid. Sky is Europe’s leading entertainment company, serving 21 million customers across five countries: UK, Ireland, Germany, Austria and Italy. We offer the best and broadest range of content, deliver market-leading customer service and use innovative new technology to give customers a better TV experience, whenever and wherever they choose.